Having high blood pressure doesn’t mean that you have to give up dessert! While many ready-made sweet treats are full of added sugar and sodium, making your own healthy desserts at home can be an easy solution to satisfy your sweet tooth. 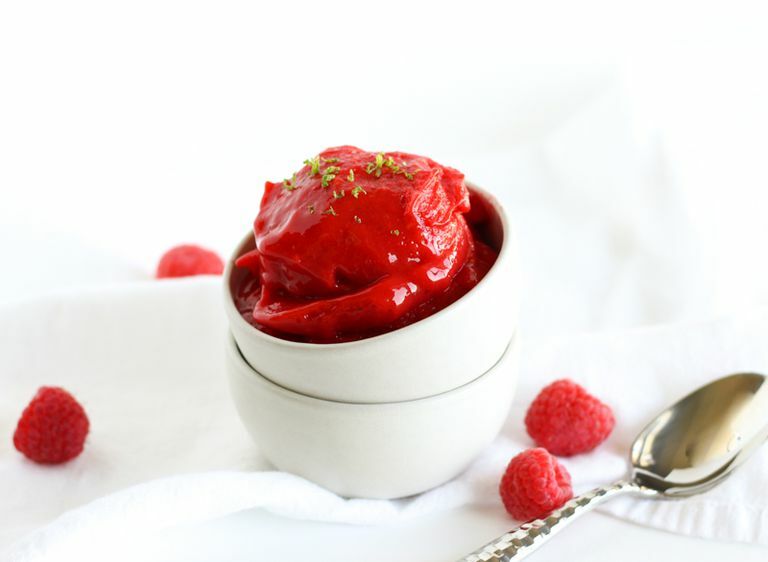 Made with just fruit, sorbet is a great blood pressure-friendly dessert to make in the summer when the weather warms up. You don’t need an ice cream maker or special equipment other than a blender. Fruit is not only full of vitamins, but it is also loaded with blood-pressure-lowering potassium and magnesium. Let frozen fruit thaw for about 5 minutes. In a high-powered blender or food processor, combine all ingredients except for water. Blend until smooth, adding water by the tablespoon as needed. This may take a few minutes. Pour into a bowl and place in the freezer to firm up just a bit, about 15 to 20 minutes. Scoop into 2 serving dishes and enjoy! Mix up your frozen fruit combinations however you’d like—just make sure you use unsweetened fruit. I love the flavor combination of raspberry and mango with the fresh lime zest, but any berries or other frozen fruit will be just as refreshing. You can also use lemon in place of the lime. Sorbet is super flexible! You can serve this straight out of the blender, but it will be softer. Note that frozen fruit may retain nutrients longer than fresh because it is frozen right after harvest, rather than losing nutrients as it is shipped to your grocery store from across the country or even the globe!